Before this week, I had never heard of Mikey Weinstein [does someone really choose to be called Mikey? 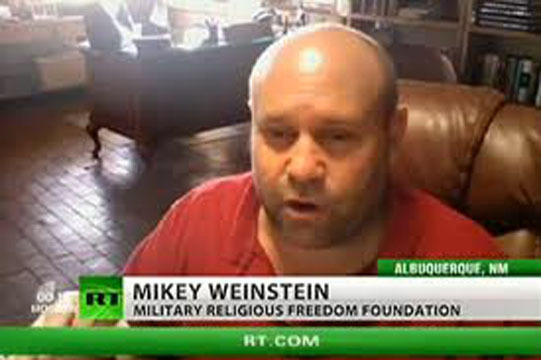 ], but he and his organization, the Military Religious Freedom Foundation, have made headlines. If you haven’t noticed, let me get you up to speed. The story first appeared on Breitbart.com and, as of last night, had more than 1.2 million Facebook shares. Weinstein, a former Air Force officer, was recently brought to the Pentagon by Obama political appointees as a consultant to help formulate policy on the type of religious expression that should be allowed or disallowed in the Air Force. His organization, though, is a stridently anti-Christian group that seeks to curtail the rights of Christians serving in the military. We face incredibly well-funded gangs of fundamentalist Christian monsters who terrorize their fellow Americans by forcing their weaponized and twisted version of Christianity upon their helpless subordinates in our nation’s armed forces. Our Pentagon has been turned into a Pentacostalgon, and our DOD has been turned into an imperialistic, fascist contagion of unconstitutional triumphalism by people that want to kill us—or have their version of Jesus kill us if we don’t accept their Biblical world view. The dominionist Christian will say, “Nothing can constrain me from proselytizing my version of Christianity.” And these people we find have several particular malodorous stenches about them. It’s like walking into a stench in my native state of New Mexico here on a hot August afternoon and having your nostrils assaulted by the stenches of 10,000 rotting swine, it’s so bad. The first stench is viral misogyny. The fact that women should be consigned to selecting food, preparing food, cleaning up after meals, spreading their legs, getting pregnant and raising children. The next [stench] is virulent anti-Semitism. The next is virulent Islamophobia. We’re fighting al-Qaeda. We’re fighting the Taliban, and we’re turning our own military in[to] the exact same thing. The dead guy—Jerry Falwell, and I’m sorry but I’m very glad he’s dead. I’m very sorry if anyone is upset about that. Let’s keep in mind a couple of things: first, for Christians, it’s a commandment to share the faith because we believe people are lost and we seek to pull them out of the pit of hell; second, the First Amendment, which should be our political guideline, says that we cannot be prohibited from the free exercise of our faith. And on the practical level, what use is a military chaplaincy if chaplains are not allowed to share what they believe? This gets to the root of the issue: Weinstein wants nothing less than the dismantling of the military chaplaincy and the removal of all Christian influence. The Pentagon, in the aftermath of this revelation and the criticism it has received, issued the following statement: “Religious proselytization is not permitted within the Department of Defense. Court-martials and non-judicial punishments are decided on a case-by-case basis and it would be inappropriate to speculate on the outcome in specific cases.” That’s supposed to make us feel better? That’s more like an affirmation of what Weinstein wants to accomplish. Of course, this is the same military, now run by Obama appointees, that has affirmed homosexuality. So homosexuality is celebrated and Christian faith is demonized. I’ve been writing about Obama’s worldview and his anti-Christian stances for the past four-plus years. In one sense, this is nothing new. However, it’s becoming more blatant as time passes. This is a real attack on Christianity in America, and we had better wake up and face the reality. More than once I’ve said that the true Christian faith is now a subculture in our society. We need to recognize that and respond accordingly. We’ve not yet reverted to the persecution era of the Roman Empire, but we need to prepare ourselves for that possibility if our culture and politics don’t change very soon.